Having fun with your food was never this easy. 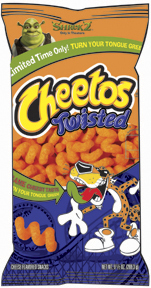 here Shrek brings a new surprise to Cheetos Twisted Snacks. making these snacks the coolest your friends have ever seen. When you're done with the color, don't worry, there's hope. Rinse your mouth out with water, wash your hands off with soap. With Shrek 2 in theaters, there's bound to be laughter. Add a bag of Twisted Cheetos snacks, and eat happily after.